Devils Thumb Pr, 1964-09-01. Paperback. Used:Good. Devil's Thumb Press. Very Good+ with No dust jacket as issued. 2001. Reprint. Softcover. 096559857 . A clean tight copy showing light shelf and edge wear only. Signed by the author on title page. ; Signed by Author . New York: Random House, 1964. The true story of the remarkable adventures of an American family who moved to Alaska and lived like pioneers. Wayne Short tells not only the exciting story of how his family learned to cope with life in one of the wildest and most remote areas in America, but also how, working together, they came to love it and accept it as a home they would never leave. Illustrated with 18 drawings by Peter Parnall. A tight clean copy in a price-clipped illustrated dust jacket.. First Edition, First Printing. Hard Cover. Near Fine/Very Good. Random House, 1964. First Edition. Hardcover. Very Good/Very Good. Parnall, Peter. New York: Random House, 1964. First edition. Hardcover. 244 pp. Very good, in a very good unclipped jacket. Book has a bumped spine tail. Prior owner's name on front pastedown. Jacket has a touch of edge wear, toned top edges, and a chip at the bottom corner of the front panel. New York: Random House, 1964. Stated First printing. Hardcover. Near Fine/Very Good. Peter Parnall, Illustrator. First printing (stated) in original unclipped dust jacket. Clean rust red boards with clean unfaded turquoise cloth spine (decorated with black bear-paw prints on front cover edge), bright gold title box on spine. No fraying, fading or wear. Binding is tight & square, no cracking. Pages and edges are clean, with clean endpapers. No names, writing or marks. Illustrated by Peter Parnall. 245 pages. Dust jacket is slightly age-toned, not price clipped (4.95 on front inside flap), has slight wear and a few short closed edge tears at top and bottom spine edges. Enclosed in new archival quality removable mylar cover. The true story of the remarkable adventures of an American family who moved to Alaska and lived like pioneers. Devils Thumb Pr, 1964-09. Paperback. Good. NEW YORK: RANDOM HOUSE. VG+/VG, DJ W/ 1 SM TR corner bump. 1962. 1ST EDITION. New York-Toronto: Random House, 1964. 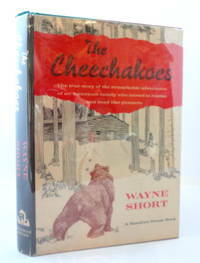 THE CHEECHAKOES- Wayne Short- Ill. by Peter Parnall- Random House- NY/Toronto- 1964-1st Edition-1st Printing-Stated- Hardcover:-8vo- VG/VG dj is price-clipped but carries 6/64 on inner lower flap-lightly rubbed and smudged but still bright and complete- Red cloth green cloth spine black and gilt illustration and titles-244 pp all clean, endpapers very slight foxing- Octavo. Stated First Printing on copyright page. Red paper covered boards with green cloth binding on the spine decorated with black animal footprints. Bright gold gilt printing on the spine. Interior is clean and unmarked. B/w illustrations by Peter Parnall. Illustrated heavy wove dust jacket.-SEE PHOTOS- "The true story of the remarkable adventures of an American family who moved to Alaska and lived like pioneers." Remarkable reading!- Non-fiction-adventure-wilderness-Alaska-illustrated (2895) . 1st Edition-1st Printing. 1/2 Cloth & Boards. VG/VG. Illus. by Peter Parnall. 8vo - over 7¾" - 9¾" tall. New York: Random House. Good in Very Good dust jacket. 1964. Hardcover. Cover in Mylar. .
NY: Random House, 1964 VG/VG in Mylar cover. out of print. Illustrated by Peter Parnall illus. First edition. Binding is Cloth Bds..
Random House. Used - Good. Ships from Reno, NV. Former Library book. Shows some signs of wear, and may have some markings on the inside. 100% Money Back Guarantee. Shipped to over one million happy customers. Your purchase benefits world literacy! NY: RANDOM HOUSE. VG/VG. 1964. ST. PAUL, MN: WEST PUB., 1939. 2 OWNER'S STAMPS, CLEAN TEXT.. FIRST EDITION. HARDCOVER. VG. NY: RANDOM HOUSE, 1964. THE STORY OF A FAMILY TRYING TO MAKE A GO OF IT IN THE POST WAR ALASKAN WILDERNESS TOP OF TEXTBLOCK DYED GREEN FOREDGE UNCUT ORIGINAL PRICE 4.95 A TRULY FINE COPY IN A FINE JACKET PRIVATELY OWNED UNMARKED. STATED FIRST PRINTING.. HardCOVER. FINE/FINE. Illus. by PARNALL PETER. HEREFORD, AZ. : DEVIL'S THUMB PRESS. VG IN WRAPS. SIGNED BY AUTHOR. PAGES CLEAN & TIGHT. Pages: 246. . 2001. TRADE PAPERBACK.. Condition: VG IN WRAPS. SIGNED BY AUTHOR. PAGES CLEAN & TIGHT. Pages: 246. New York: Random House 1964, 1st printing. (Hardcover) 244pp. Very good plus in very good dust jacket. Illustrated half-cloth. Frontispiece, illustrations. Illustrations by Peter Parnall. Locale: Admiralty Island; Alaska. (Western Canada, Outdoor Life). Random House, N. Y.. Fine in Fine dust jacket. 1962. hardcover with dustjacket. The book has a little foxing inside the hardcover other wise in fine condition. The dust jacket is in fine condition. There are no names or markings in the book. It's a true story of an American family who moved to Alaska and lived like pioneers. ; Standard Book Size; 244 pages . New York: Random House, 1964. First Edition, First Printing. Hardcover. Near fine in original cloth backed boards and near fine pictorial dust jacket. A lovely copy with just a touch of edgewear and toning to endsheets.. Octavo. 5.75 x 8.25 in. 244 pp. Illustrated in black-and-white by Peter Parnall. Devil's Thumb Press, 1995. Paperback. Good. Disclaimer:A copy that has been read, but remains in clean condition. All pages are intact, and the cover is intact. The spine may show signs of wear. Pages can include limited notes and highlighting, and the copy can include previous owner inscriptions. At ThriftBooks, our motto is: Read More, Spend Less.Dust jacket quality is not guaranteed. New York: Random House. Near Fine in Very Good dust jacket. 1964. First Edition; First Printing. Hardcover. Maroon cover with quarter turquoise spine with black paw prints along the front & gilt on the spine. Illustrated dust jacket shows quite a bit of sun tanning with edge rubs & 2 small (1/8"") tears. Very crisp, tight, clean book. If read, only lightly. Not price clipped. Original price $4.95. ; 8vo 8" - 9" tall; 244 pages . Devils Thumb Pr. Paperback. GOOD. Spine creases, wear to binding and pages from reading. May contain limited notes, underlining or highlighting that does affect the text. Possible ex library copy, thatâll have the markings and stickers associated from the library. Accessories such as CD, codes, toys, may not be included. New York: Random House, 1964. 4th. Inscribed by Short on front flyleaf. A tight, clean copy in quarter green cloth binding. Dust jacket is lightly rubbed at spine ends and offered in protective mylar cover. 244pp. The true story of the remarkable adventures of an American family who moved to Alaska and lived like pioneers.. Inscribed and Signed By Author. Hardcover. Very Good/Very Good. Illus. by Parnall, Peter. 8vo - 8" - 9" Tall. Devil's Thumb Press, 1995. Paperback. Very Good. Disclaimer:A copy that has been read, but remains in excellent condition. Pages are intact and are not marred by notes or highlighting, but may contain a neat previous owner name. The spine remains undamaged. New York: Random House, 1964. Very Good. First edition. Very good minusCover rubbed. Foxing. Please Note: This book has been transferred to Between the Covers from another database and might not be described to our usual standards. Please inquire for more detailed condition information. New York: Random House, 1964 Illus. by Jun1006-01. Hard cover. Good. Good in Good jacket Good in Good jacket Good in Good jacket 244 p. Jun1006-01; Autobiographical. ; Alaska; Biography & Autobiography; Frontier and pioneer life; General; Non-Fiction; Pacific (Alaska, California, Hawaii, Nevada, Oregon, Washington); Short, Wayne; Travel; United States; West..
New York, N. Y., : Random House, , 1964. 1st Edition 1st Printing. Hardcover. Very Good/Very Good. 8vo - over 7¾ - 9¾" tall. Gift inscription, otherwise clean and unmarked. Parnall, Peter (illustrator). 1st Edition. 8vo - over 7¾ - 9¾" tall. Green and red boards with gold print and detail along spine, black bear tracks along the front cover. Covers and edges are clean, text and illustrations are all bright and clean.DJ is unclipped however has wear on corners. Petersburg, AK: Devil's Thumb Press, 1988 Contains a map and illustrations. 244 pp. Edge & corner wear; corner creases on front & back cover; spine creased; some very light soiling; writing on at least 1 page. . Soft Cover. Good. Illus. by Parnell, Peter. 8vo - over 7¾" - 9¾" tall. NY: Random House 1964, 1962 Very good; dust jacket short tear, light soil, good+. 8 vo. 245 pp. B/w illustrations by Peter Parnall, red boards/blue cloth.. Stated First Edition. Hard Cover. Random House. Very Good+ in Very Good dust jacket. 1964. First Edition; First Printing. Cloth. Half red hardcovers and half turquoise cloth covering with bear prints on it. Stated First Printing. Very Good+, tightly bound, a bright unmarked text, deckled edges. Light spine end bumping. The DJ is Very Good, clipped with cover scuffing, no tearing to the edges, light spine end bumping. "On the wild shores of Surprise Harbor at the tip of great Admiralty Island, the Shorts lived in a tent while they constructed a cabin. For the next year they discovered a life completely different from anything they had ever known before. They had to do everything themselves. The mother had to learn to keep a home and garden in a country which contributed nothing to domestic comfort. "; Drawings; 8vo 8" - 9" tall; 244 pages . New York: Random House, 1964. Book. Very Good +. Hardcover. First Edition/First Printing. A square solid tight carefully read copy. This copy has a couple of light corner/edge bumps, light cover soil, browning to extremities, foxing to endpapers. The 4.95 priced plain paper jackst has some rubbing wear, edgewear, some soil, some chipping at the top and heel of the spine, some browning.. Le Livre De Poche. circa 1960. in French. Near Fine to Fine condition. New York: Published by Random House, CR 1962, 1964, stated 1st printing, 244 pages. Dust jacket shows wear and slight tears with old price on front cover, book and contents good. Drawings by Peter Parnell. True story of the remarkable adventures of an American family that moved to Alaska and lived like pioneers. Biography, Alaska, natural history.. Hard Cover. Petersburg, NY: Devil's Thumb Press. VG PB. (1988). 1st ptg ss. True adventures of an American family who moved to Alaska & lived like pioneers. .
NY: Random. VG in G DJ. (1964). 1st ptg. True story adventure of an American family who moved to Alaska and lived like pioneers. DJ tanned on edges and writing. .
NY: Random. VG in G DJ. (1964). 1st ptg ss. DJ damp stained inside, sl edge wear. True adventures of an American family who moved to Alaska & lived like pioneers. .
New York: Random House. Very Good in Very Good dust jacket. 1964. First Edition. Hard Cover. 246 rough cut pages. Both ends of spine on dustjacket worn. " The true story of the remarkable adventures of an Ameirican family who moved to Alaska and lived like pioneers. "515g weight; 8vo . New York: Random House, 1964. 244 pp. Homesteading on Admiralty Island.. First Edition. Hard Cover. Very Good/Very Good. 8vo - over 7¾" - 9¾" tall. New York: Random House, 1964. Red boards with green cloth spinecover, light wear. Pages are clean, text has no markings, binding is sound. . First Printing. Hard Cover. Good/No Jacket. Illus. by Parnall, Peter. 8vo - 7¾" - 9¾" Tall. New York: Coward, McCann & Geoghegan, 1971. 123 pp.. First Edition. Cloth. Good/Good. 8vo - over 7¾" - 9¾" tall. New York: Random House, 1964. Stories of life in Alaska. Dust jacket has a 1" tear/crease on bottom rear corner. Looks fine within new clear Brodart sleeve.. First Edition. Hard Cover. Near Fine/DJ Near Fine (fault). Illus. by Peter Parnall. Octavo. New York, New York: Random House, Inc., 1964 Book. Illus. by Peter Parnall. Good+. Hardcover. 2nd Edition. 8vo - over 7¾ - 9¾" tall. G+/G+, used hc, 244 pgs. Three-quarter red paper over boards with black paw print illustrations on turquoise cloth and gilt and turquoise text on spine; slight edge wear; light mildew damage. Color illustrated dust jacket with black, cream and red colored text on upper and cream and red colored text on spine; edge wear; perhaps bug damage on spine and flap folds; not price clipped; encased in protective mylar wrapper. Interior pages clean, unmarked; deckle fore edge. Binding is tight and straight. The complete title includes: "The true story of the remarkable adventures of an American family who moved to Alaska and lived like pioneers"..
VIKING PRESS. GOOD NO DUSTJACKET. HARDCOVER W/JACKET. Alaska: Devil's Thumb Press,, 1995. One word underlined.. Paperback. Near Fine. Trade Paperback. New York: Random House (1964), 244pp, slight soiling to cover, a few small tears & some edgewear to dj.. Hard Cover. Very Good -/Good. Illus. by Peter Parnall.